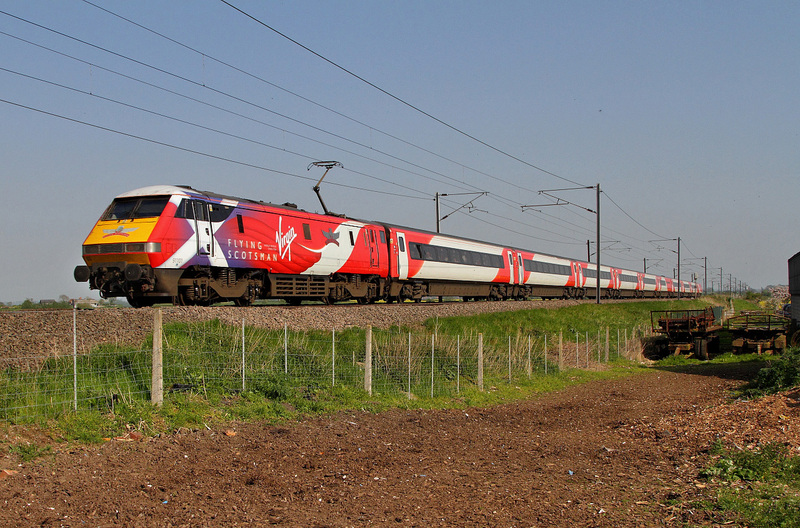 A dedicated class running exclusively on the ECML between London-Kings Cross and Edinburgh.All still in service and will be for some considerable time. 91106 c/w its advertising vinyl's for the 'Great Exhibition of the North 22 Jun-09 Sept 18'.DVT 82220 was on the rear.Seen at Claypole.All so much more colourful and pleasing to the eye than the dross we have to put up with down in the West Country.For years it was FGW-Blue and then a golden opportunity for a nice appealing colour scheme was completely blown when GWR came up with its god-awful sludge-green effort! 91106 adorned with an advertising livery 'Great Exhibition of the North 22 Jun-09 sept-18' runs northwards at Claypole past the rank of abandoned old farm machinary with '1S23' the somewhat delayed (30 minutes)15:30 from Kings Cross going up to Glasgow-Central.DVT-82220 being hung on the back. 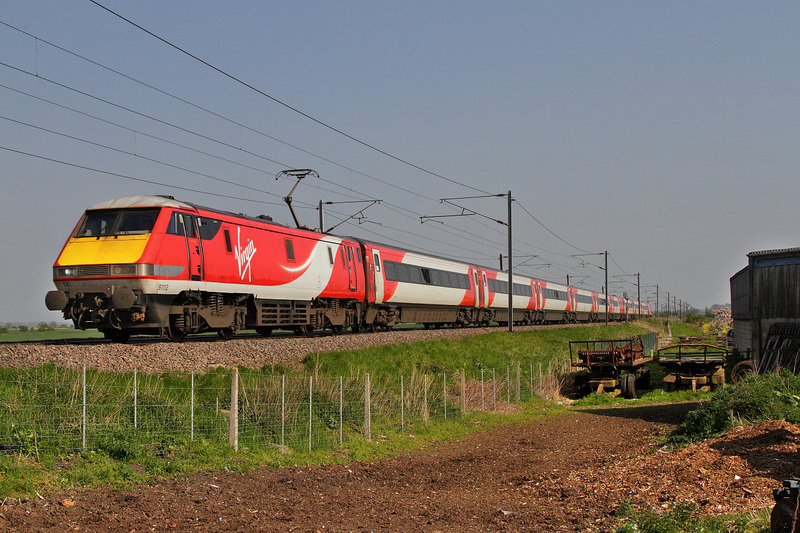 Finally a shot of 91101 'Flying Scotsman' as it speeds south with the 13:30 from Edinburgh to Kings Cross '1E17'.DVT 82214 was the leading vehicle.Seen at Claypole Farm south of Newark. 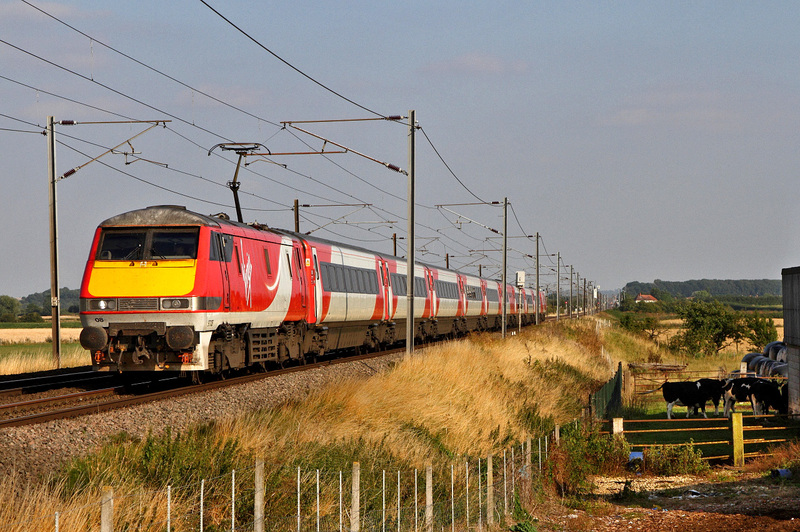 91122/82222 heads north at Claypole with '1N87' the 15:08 from London-Kings Cross going only as far as York. 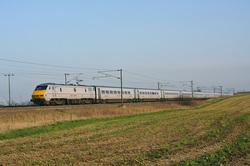 91112 along with 82216 speeds past Claypole Farm with '1D19' the 15:05 from Kings Cross going up to Leeds. 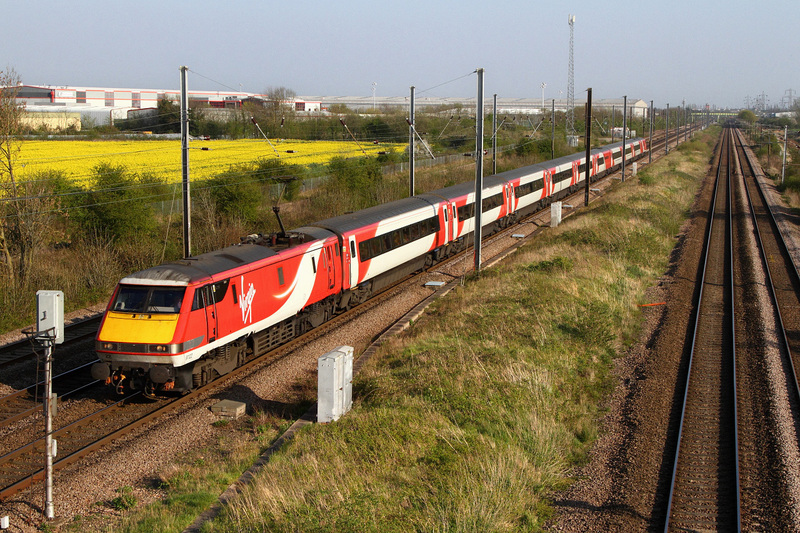 'Lord Mayor of Newcastle-Proudly celebrating 800 years of Newcastle's Majesty 1216-2016' 91130 heads northwards on 1S27' the 17:30 from Kings Cross to Edinburgh.Here passing the agricultural graveyard at Claypole.DVT 82212 being the tail-end charlie today. 'VTEC' 91108 speeds northwards here at Claypole with DVT-82213 on the rear of '1D23' the 17:03 from Kings Cross going to Leeds.Note the height of the 'OHLE' here from the fully stretched pantograph on the '91'.This is to allow plenty of distance under the wires across the farm crossing here at this location.The last thing you need as a tractor driver with a large trailer is a large bolt of 25KVa through your driving seat! 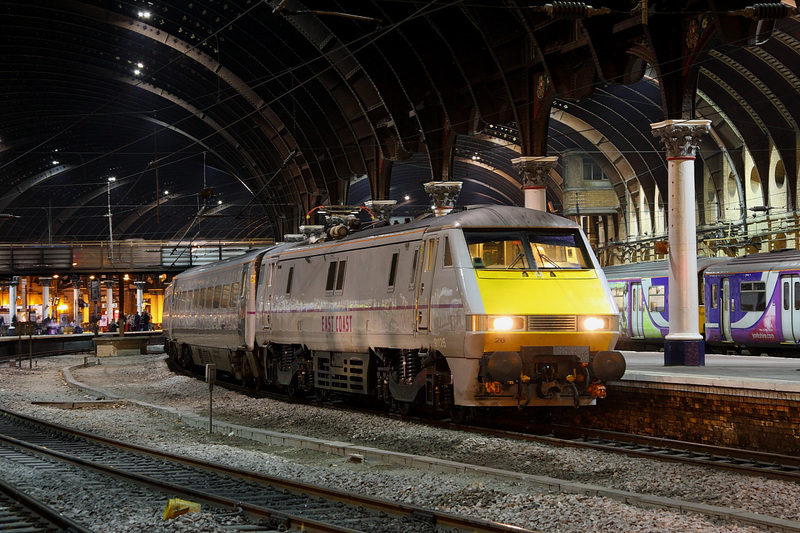 These Class-91' can probably claim to be the final ECML-Greyhounds following in the footsteps of LNER-A4's/A3's/BR-Deltics and HST's.I do not think the new IEP's will qualify even though they are definitely some kind of Mongrel-dogs! Anyway here is 91132 vinyl'd as 'Time to Change-Employer Pledge' pushing its way down to Kings Cross in the Capital working '1E19' the 14:30 from Edinburgh.I fully expect this location will still be strewn with this redundant agricultural equipment when the IEP replacements start passing by in a few years time.I certainly won't be here to see them that's for sure! 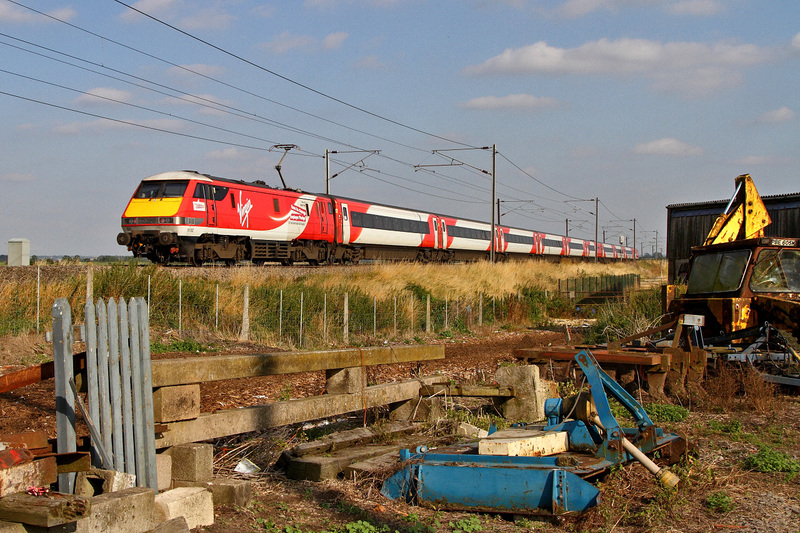 Note --This is the loco involved in both the Hatfield and Great Heck rail disasters as 91023,albeit undamaged both times and as such it was decided to renumber it as 91132 in good taste when it was upgraded. 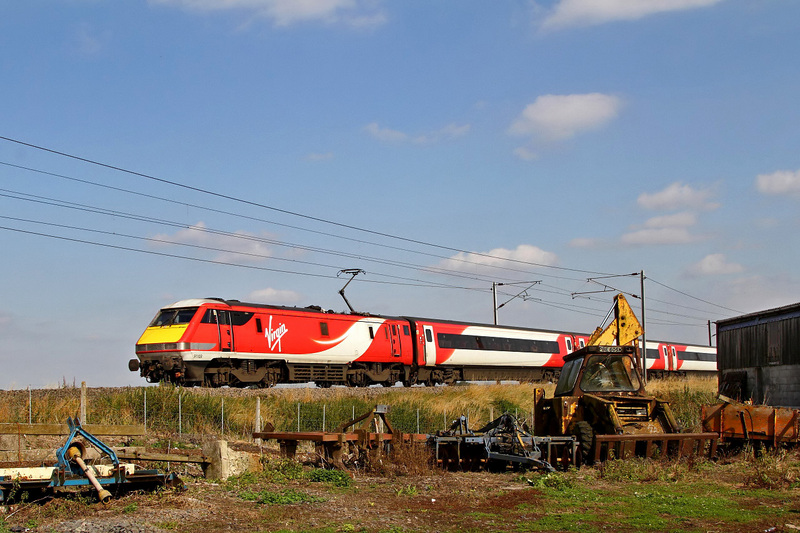 91103 pushes south at Broad Fen Farm-Claypole working '1A39' the 15:45 from Leeds down to the 'Cross' in the Capital.By now with the time approaching 17:00 the skies had finally cleared to produce unbroken sunshine for the remainder of our visit here on the ECML. 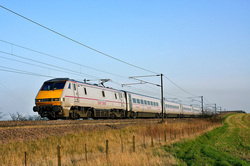 91124 heads '1S23' the 15:30 from Kings Cross going to Glasgow-Central past Claypole going north. 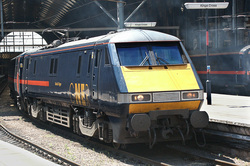 DVT 82217 being on the rear. It is hard to believe that these locomotives,Coaches and DVT's will mostly be removed from service in less than 2 years time to be replaced by those horrible IEP things! They call it progress---I think ? 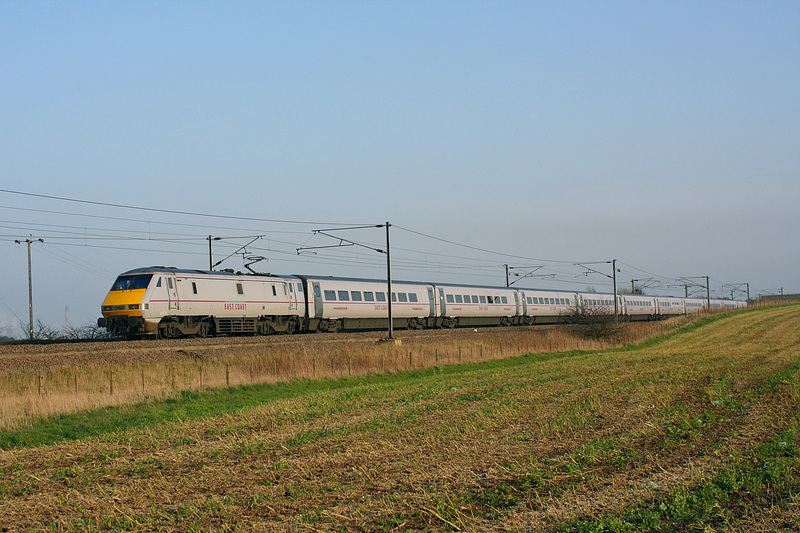 91130 runs northwards away from Werrington-Junction north of Peterborough at Marholm going to Leeds with the 17:03 from Kings Cross as '1D23'.DVT 82213 being on the rear.Note how high the pantagraph on the Class-91 is on this stretch.Almost fully extended by the looks of it? 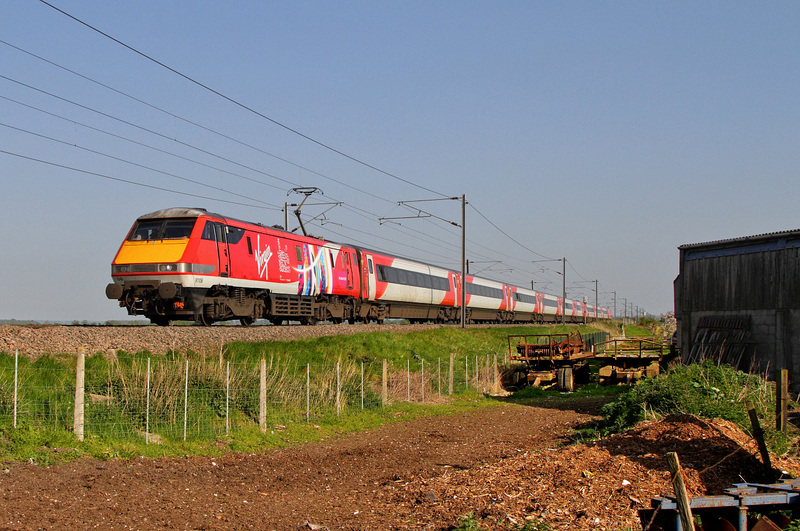 Virgin-Red 91122 with DVT 82214 on the rear speeds up past Werrington-Junction nr Marholm with '1S25' the 16:30 from Kings-Cross going to Edinburgh. 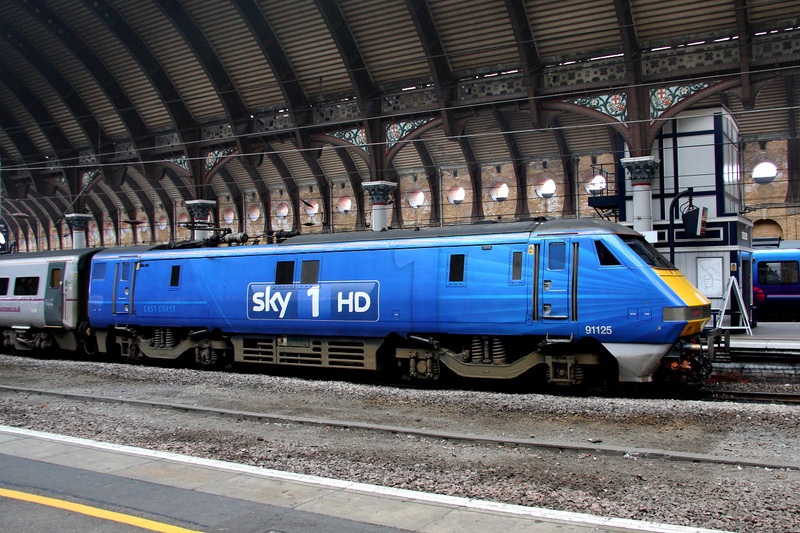 91125 wearing the publicity livery applied to coincide with a TV program all about the ECML Company 'East Coast'.No prizes for working out which channel! 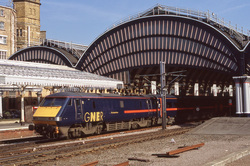 On this occasion 91125 was pushing the 10:00 from Edinburgh to Kings-Cross '1E10'.It is recorded during its booked stop here at York under the iconic overall roof there. 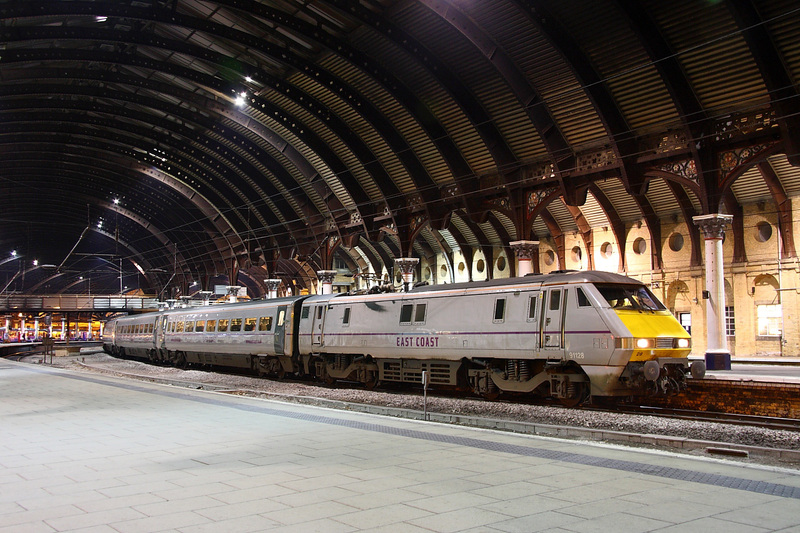 ECML 'Greyhound' 91128 pauses at York with '1S28' the 18:00 from London Kings-Cross going to Edinburgh (Where else? 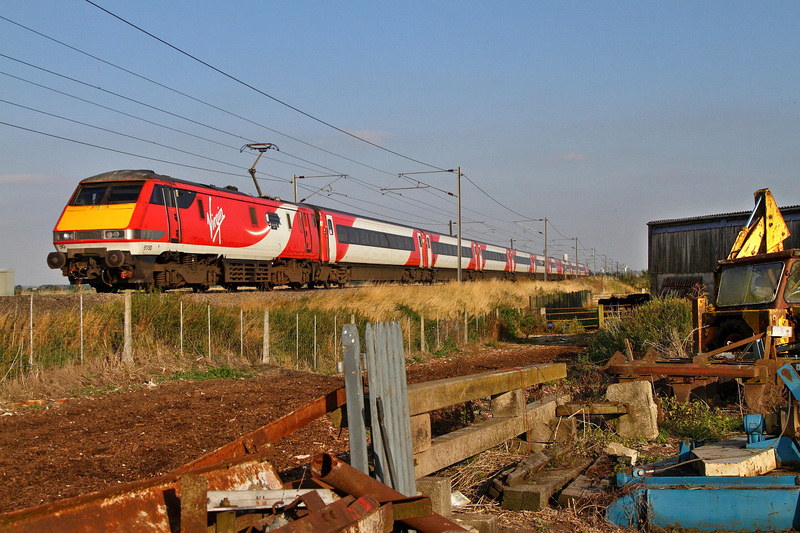 ).All the '91-s' are at the north end of these workings and although they do have a second cab installed at the 'blunt-end' of this 31 strong class it is seldom used except in emergencies.Interestingly 91023 when it was renumbered became 91132. Railwaymen are a superstitious bunch and after that one was involved in both the Great Heck and the Hatfield crashes that particular number was retired--hence 91132 appeared in the loco lists. 91121 on '1S26' was hot on the heels of the previous Edinburgh service ''1S25' which was running nearly 20 minutes late.This one the 17:00 off Kings- Cross also has a final destination of the Scottish Capital. 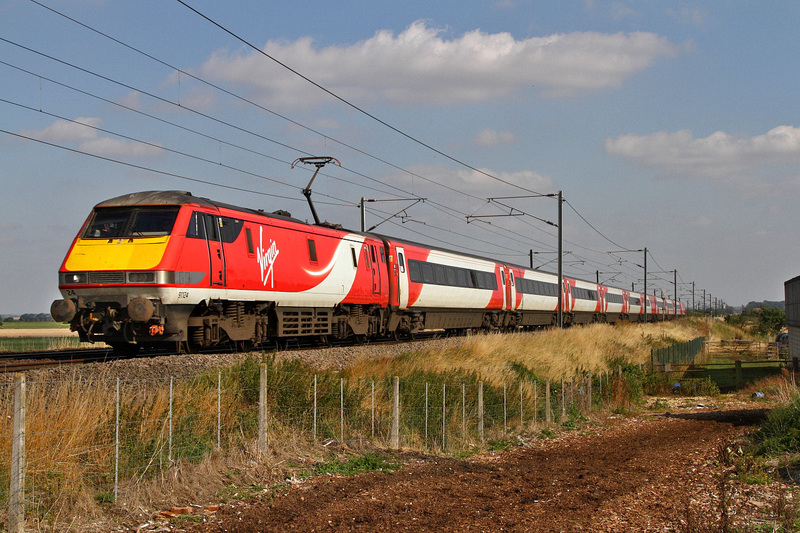 All these fixed formation ECML '91' hauled sets stop in exactly the same spot here at York. 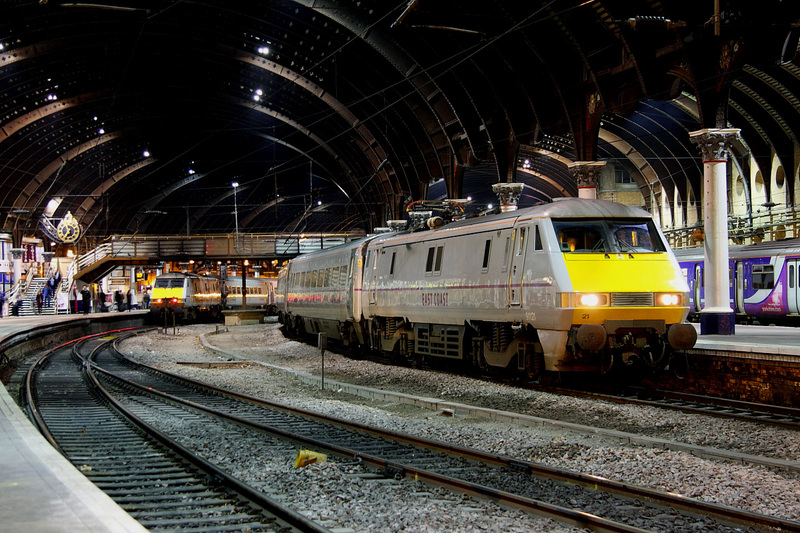 Note the southbound express heading for Kings Cross with yet another '91' but this time pushing from behind.By convention all these Sets have the locomotive at the northern end with no variation. 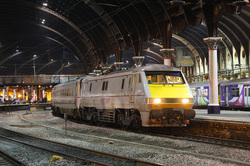 '1S25' the 16:30 from King- Cross going to Edinburgh pauses under the roof at York. Current ECML Greyhound 91126 was heading this train.Originally it was numbered 91026 and was introduced in Inter-City Swallow Livery.Next came GNER Blue/Red.After that a mish-mash for a few years before ending up as this rather pleasing Silver-style representing the 'East Coast' renationalised train company.Not sure what is coming next but if the franchise is reprivitised you can be sure to passengers will ultimately lose out in the name of capitalism! 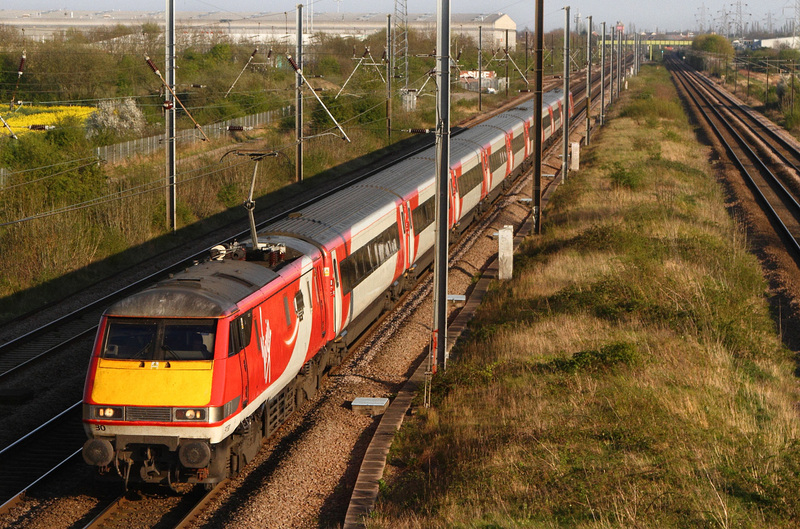 This is '1E18' the 14:00 from Edinburgh rapidly disappearing south towards London headed by an out of sight 82227 with 91105 pushing hard from the back. Pictured from the fields of Lund farm west of Selby.We talked to the Farmer/Owner and he was more than happy for us to use his fields here for shooting pictures of the passing trains.Unlike some of the Luddites that now increasingly use the well known phrase or saying 'Get orf my land' down south! 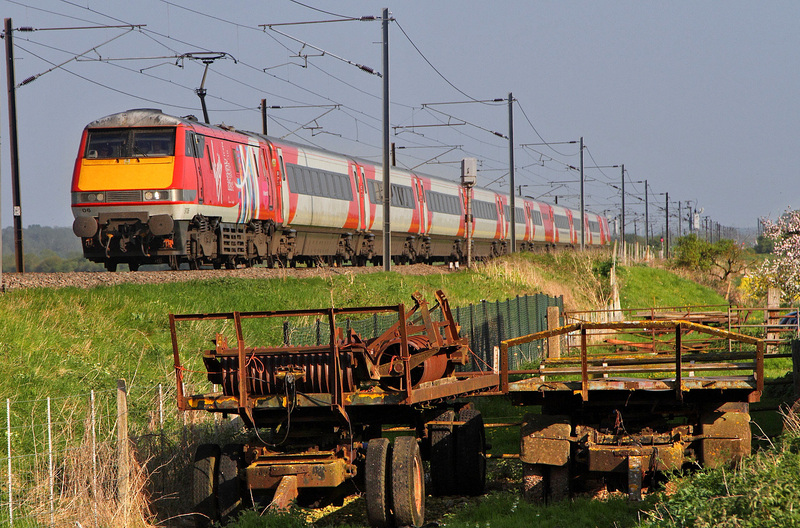 Class-91/DVT set headed by 91128 with 82212 on the rear powers '1S22' the 15:00 from Kings Cross going to Edinburgh.Here passing Lund Farm nr Selby.This area appears to be mainly devoid of the dreaded palisade fencing that is progressively ruining most lineside locations these days particularly its opposite-number out of Euston,the WCML south of Rugby! ECML Racehorse 91109 gets away from York heading north emerging from the overall roofed station there..Looking superb in the excellent GNER colours it was then carrying the 'cheapo' sticker-name 'The Samaritans'. Later on it gained a proper cast nameplate commemorating a former England Football Manager 'Sir Bobby Robson'. 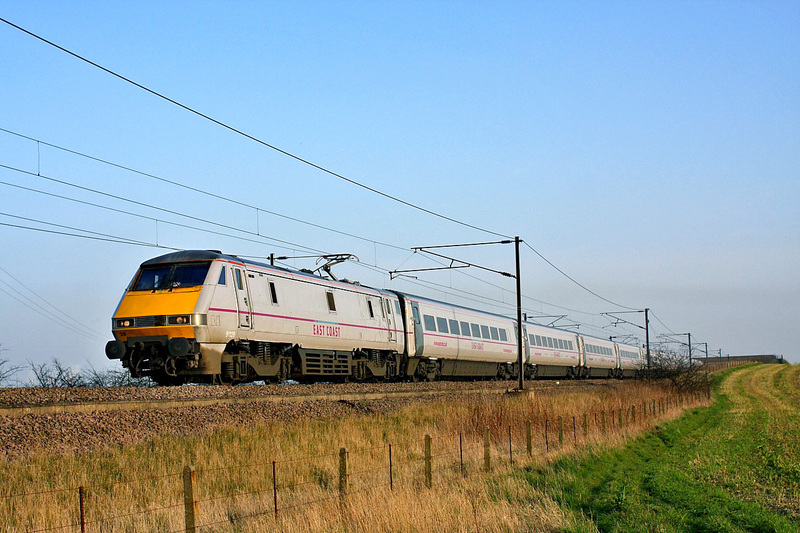 The current 'Racehorse' type to grace the ECML are the Class-91's. 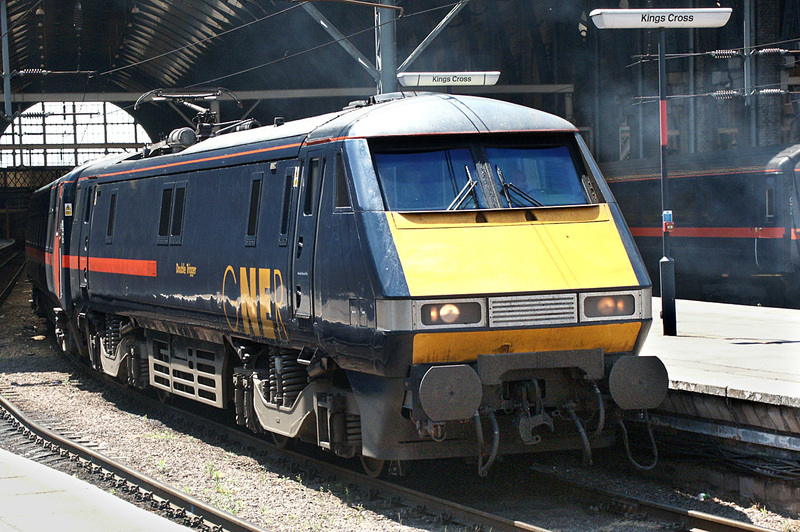 Here is 91122 named 'Double Trigger'.Previous loco types graced with Racehorse names included A3/A2 and A1 LNER steam pacifics and of coarse the Deltics. 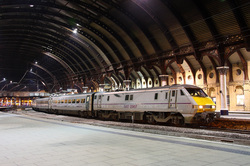 This engine is seen at Kings-Cross about to depart north on the ECML.It is wearing the then current superb GNER colours that suited these trains so well.